How your home based business may put you at risk - Scarsdale Premier Insurance Agency | Advocate Brokerage Corp.
One in four people living in the US operate some type of home based business. Add in telecommuters and you have a large percentage of the population who may have gaps in their current insurance coverage! Today we would like to talk about home based businesses and how relying on your homeowner’s policy to provide for your business insurance needs might be a mistake. A home based business is any business whose primary office is located in the owner’s home. The business can be any size or any type as long as the office itself is located in the home. So, if you sell cosmetics or storage containers or are a part of one of the many MLMs, you have a home based business. If you are an entrepreneur who refinishes furniture or makes crafts, sells real estate or prepares taxes and you do it from your home, you have a home based business. While your homeowners policy would likely offer some protection, the reality is that relying solely on your homeowners policy could leave you with gaps in coverage. For example although some of your property might be covered, there are property coverage limitations (office furniture, computer equipment, software, etc.) if a covered loss damages your property. Coverage if your home office is located in another structure on your property such as a detached garage or barn. Specialized coverage – including workers compensation or professional liability. 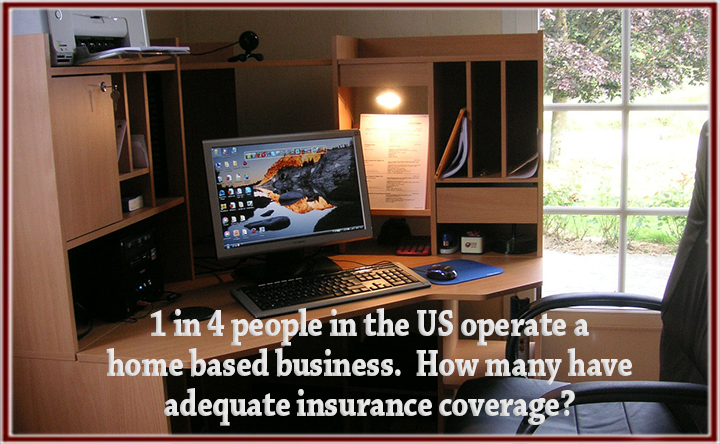 People who work for a larger corporation, but do so from a home office could experience gaps in their coverage as well. The question becomes what does your employer’s policy cover and what does your homeowner’s policy cover? If someone delivers a work related package to your home, slips and falls resulting in an injury, which party will be held liable? It is important that you discuss all the factors ahead of time so that there are no surprises. A meeting with your employer to find out what types of policies they have in place is important, as well as reaching out to your insurance broker to find out how much protection your homeowner’s policy provides. An endorsement can be added to your existing homeowner’s policy. We want to be your Advocate for every insurance need. If your homeowner’s policy no longer provides adequate coverage, we can help find a specialized policy or a business policy to help fill in the gaps. If you operate a business from your home or telecommute and have questions about your risks, please set aside some time to speak to one of our customer service representatives.